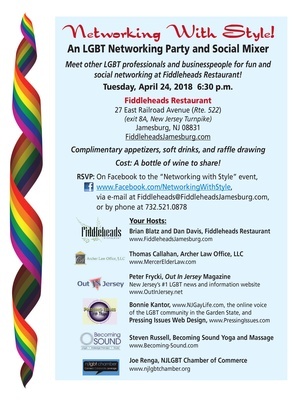 Join the NJ LGBT Chamber of Commerce on Tuesday, April 24th at a fantastic networking event, Networking With Style, hosted by the LGBT owned Fiddleheads Restaurant, in Jamesburg, NJ. Networking With Style is a long running networking event that serves the Central Jersey LGBT community, and which the NJ LGBT Chamber of Commerce has long supported. The evening will be hosted by Manager/Co-Owner Brian Blatz and includes mixing and mingling, so bring your business cards and brochures. During the evening there will be an open mic, so you can tell the crowd what you do and what you're looking for. The Chamber will have a table in the restaurant where you can learn more about all that we are looking to do for New Jersey LGBTQ business owners, business people and LGBTQ non-profit organizations. Just bring a bottle of wine to share. 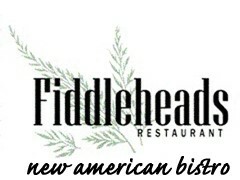 And enjoy complimentary appetizers and soft drinks, provided by Chef/Co-Owner Dan Davis.